As a food blogger, I often feel guilty about the amount of my food waste. Because let's admit it — it's rather indulgent and unnecessary to have a hobby that involves baking a dessert from scratch every few days. And let's talk about the fact that there are a lot of recipes out there that use odd amounts of ingredients. A third of a can of sweetened condensed milk? 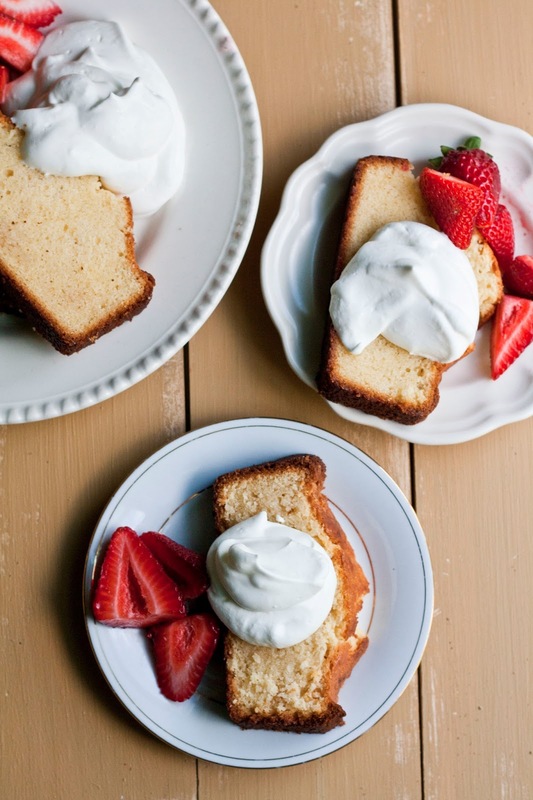 Just a few tablespoons of cream? What am I supposed to do with the rest of the ingredients, especially if they're going to perish in a few days? I hate to say it, but it used to be that the remaining quantities will sit in my fridge and simply spoil because I've forgotten about them. Yikes. These days, I've been trying to be better about reducing my food waste as a whole. I've always been fairly good at dividing up the baked goods between coworkers and friends, making sure that there are no extras that sit around my kitchen uneaten. With leftover ingredients, I've learned to become more mindful and more flexible — that is, whatever ingredients I have on hand will be those that will be used in my baked good for the day, period. This philosophy sometimes creates new challenges and exciting combinations in my baking. A few days ago, I made a delightful, no fuss, strawberry ice cream that unfortunately used odd quantities of ingredients — for instance, the recipe only used 1/2 cup of sweetened condensed milk, which is about a quarter of a regular 14 ounce can. I also ended up with open and unfinished containers of cream and fresh strawberries. Staring at the three ingredients before me, I initially had varying ideas of what I wanted to make. What if I used the sweetened condensed milk for an iced coffee drink, and the strawberries and cream for a strawberry milkshake? Great ideas, sure, but somehow, that didn't feel right. I felt like the three ingredients were meant to be together. Peeking in my fridge for some more scraps, I found three leftover eggs. And that's when it occurred to me. Why don't I just make a cake? No, nothing too fancy or requiring too much prep work. Instead, I was opting for one of those simple, vaguely rustic and yet delicious loaves. You know, the kind that the ladies of yesteryear threw together on a whim with whatever they had in their pantry? 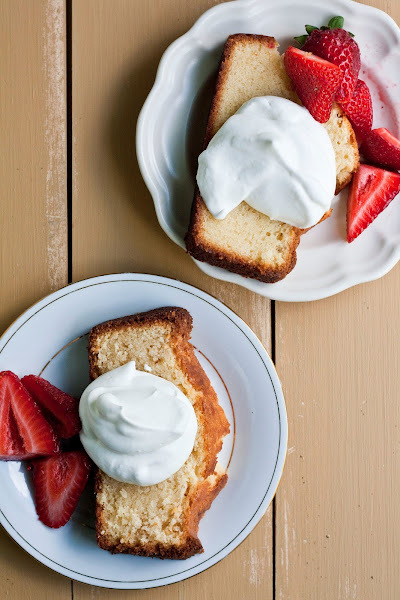 Since the strawberries were in their prime (it's strawberry season in Oregon! ), I wanted to feature them on their own. I ended up soaking the strawberries (in a process called maceration) in rosewater and vanilla to really bring out their flavor. The cream I had was also pretty top-notch — a tiny bottle from my favorite dairy, Strauss Family Creamery in California. It was also worth featuring on its own, which I did simply by whipping it up with a teeny bit of sugar. 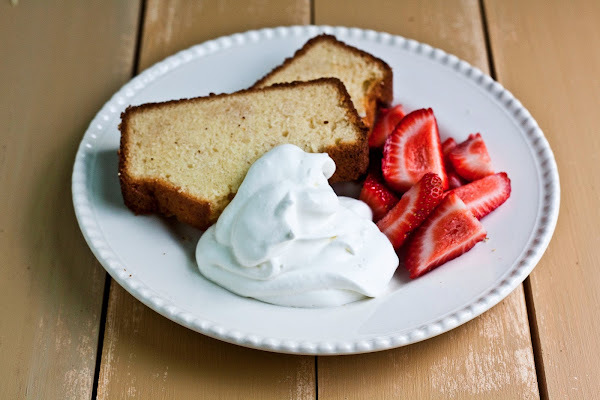 And since the strawberries and cream were getting their own spotlight, I decided to make a simple loaf cake that featured the sweetened condensed milk as its main ingredient to make sure one of my favorite ingredients got its fair share of attention. The result was great: a dense, golden loaf that tastes faintly like sweetened condensed milk and browned butter. But the three elements together — that is, the sweetened condensed loaf combined with the macerated strawberries and whipped cream — really just shined. It was the sort of simple dessert that a high-quality restaurant mindful of the seasons would serve. The kind of simple dish that stands as a testament to the fact that all you need are simple, delicious ingredients to make great food. Be sure to use the best strawberries you can find! Choose berries that are smaller and darker red; in general, this signifies that they are riper and will yield more juice and flavor. I soaked the strawberries in vanilla and rose water, which is available in the international section of any fancy grocery store like Whole Foods. If you can't find rosewater or don't want to spend that much on a specialty ingredient, you can replace the vanilla and rosewater with 4 teaspoons orange juice or orange liqueur like Grand Marnier. In a medium bowl, combine 2 pints strawberries, 2 teaspoons rose water, 2 teaspoons vanilla extract and 1/2 cup granulated sugar. Stir to coat the strawberries, cover the bowl, and let the berries soak (macerate, if you want to be fancy) at room temperature until they exude their juices. This should take at least an hour. Preheat the oven to 325 (F). Prepare your loaf pan by generously buttering or spraying with cooking spray. In a medium bowl, whisk together 1 1/3 cups flour, 3/4 teaspoon baking powder, and 1/2 teaspoon salt. Set aside. In the bowl of a freestanding electric mixer with a paddle attachment, cream together 1 cup unsalted butter and 1/2 cup granulated sugar on medium-high speed, until light and fluffy. Once the butter and sugar is light and fluffy, turn the mixer to its lowest speed and slowly add 3 eggs, one at a time, only adding each egg after the egg before it has been fully incorporated. Once the eggs have been incorporated, turn off the mixer and whisk together 2 teaspoons vanilla extract and 3/4 cup sweetened condensed milk. Turn on the mixer to its slowest speed and add the dry ingredients (from the second step) in 3 parts, alternating with the sweetened condensed milk mixture (from the fourth step) in two parts. DO NOT OVERBEAT — simply beat together until all the ingredients have just been incorporated. Transfer to your prepared loaf pan, using a rubber spatula to spread the batter evenly across the pan. Bake in the preheated oven for about 1 hour, or until the top is a dark, golden brown and a skewer inserted into the middle of the cake comes out clean. Cool completely on a wire rack before unmolding. 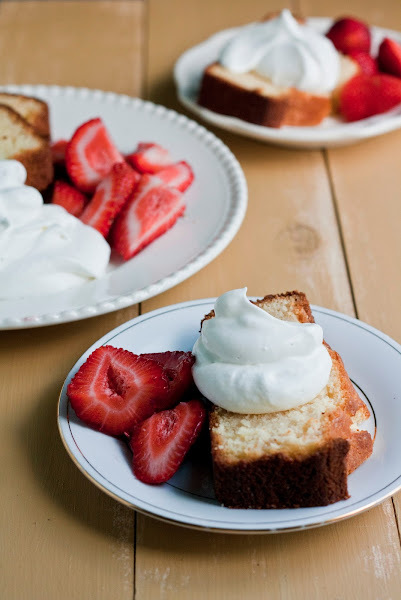 When you're ready to serve the loaf, prepare the whipped cream by whisking together 1 1/2 cups heavy cream with 2 tablespoons granulated sugar in the bowl of a freestanding electric mixer with a whisk attachment. Use immediately. I've never heard of the trick of soaking your strawberries before... I can't wait to try it! 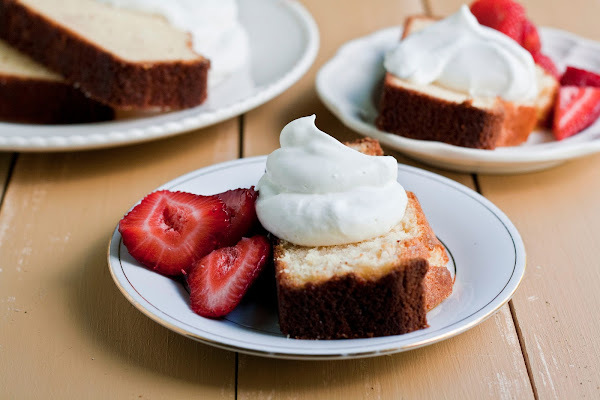 Beautiful photos that make me want to eat my screen as usual! look at you being resourceful! looks delish. I know what you mean about partial containers in the fridge... I buy the cat food can lids from Dollar Tree and usually have half a can of coconut milk and half a can of tomato sauce in the fridge... luckily those are pretty easy to integrate into other recipes, though! Oh man, how inspiring for me to start getting more creative with my leftover ingredients... not to mention that this looks so fresh and delicious. This blog entry sounds like its right out of an episode of "Chopped".. open your baskets!!! You did very well with this recipe. Im all for repurposing, reusing, and recycling anything and everything which includes less waste from the fridge. Good job!!! !